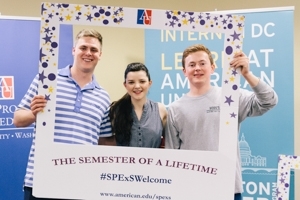 American University's School of Professional & Extended Studies (SPExS) celebrated yet another successful semester of academic and professional achievement. Students, faculty, and staff were invited to the End of Semester Completion Celebration to celebrate their accomplishments and reward those who went above and beyond in their programs. Several hard-working SPExS cohorts were present for this bi-annual gathering, including those who completed the Washington Semester Program (WSP), Graduate Professional Studies (GPS) program, the AU GAP program, the graduate certificate in Project Monitoring & Evaluation, and the English Language & Training Academy (ELTA) program to not only award exceptional scholars, but to continue the age-old tradition of professional advancement that each student will carry on to the rest of their careers. "[A]ll of our students are exceptional, and each and every one of them has dedicated him or herself 200% to having the semester of a lifetime," said Dr. Carola Weil, the Dean of SPExS in her welcoming remarks. In her speech, Dean Weil recognized several students across these diverse programs for the accelerated leadership and professional accomplishments made throughout their stay at American University. Under the Gap Year Program, Jonathan "Jack" Budington, Joseph Caplis, Kyle Clements, Will Cole, Zachary "Zeke" Somers tied for Excellent Academic and Internship Performance in a Gap Year, and Peter Santo earned Outstanding Performance in a Gap Year Program. Wyatt Scott, a Washington Semester Program alumni, received an award for Best Research Project. Two special Leadership awards were also given during this reception. Kaleigh Gillen of the AU Gap Program International Affairs Seminar and Joseph Harris of the Washington Semester Program American Politics Seminar won Best Leadership in the Classroom. Above all, each member of the spring 2017 cohort had the opportunity to be part of the living history of our nation's capitol. They witnessed the first 100 days of a new presidential administration, took to the streets for several record-breaking marches, connected with over 2,500 internship supervisors and organizations, and spent over 99,000 hours at prestigious internships throughout Washington. More than a chance to enhance their professional competencies, each SPExS program empowered and encouraged each student to make up the fabric of Washington DC. "No matter how you spent the past semester, you will take away something from these experiences that will help shape your future and lives for many years to come," affirmed Dean Carola Weil. Indeed, as this new cohort of SPExS alumni return to their respective schools, they now take with them new skill sets, expanded networks, and memories of our nation's capital, keeping with the tradition of excellence and achievement for many years to come.